The Class of 1963 celebrates its 50th Reunion this June. We took a look back at some facts and interesting developments during the senior year of the class. Robert Frost gave one of the last lectures of his life at the Hopkins Center. He died in January 1963. Virginian Bill King ’63 received the Barrett Cup, presented to the most outstanding senior. King later served as a Dartmouth trustee. 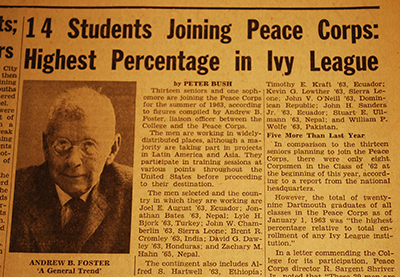 Story in the May 29, 1963 issue of The Dartmouth.